In a recent press release, PULSE@MassChallenge announced that ThinkGenetic was accepted into the Boston-based 2018 startup class out of 500 worldwide applicants. ThinkGenetic’s Boston-based team members, Ruth O’Keefe, Marketing Director and Dave Jacob, CEO at new PULSE office. Photo Courtesy of PULSE@MassChallenge. Previous startups that have participated in PULSE@MassChallenge have raised more than $52M in funding, generated more than $13M in revenue, and grown their employee headcount by an average of over 22 percent to date. Launched as a strategic component of Mass Digital Health and fueled by public-private partnerships, PULSE@MassChallenge accelerates the impact of digital health startups around the world. Beginning this month, ThinkGenetic will have access to a tailored curriculum, co-working space, and the opportunity to apply for shares of $50,000 in need-based scholarships – all at zero cost and for zero equity. 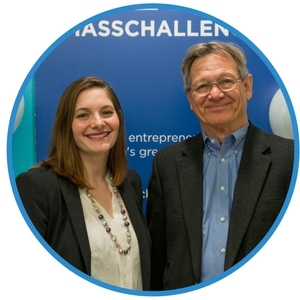 A very important aspect of the PULSE@MassChallenge is the “Champion” pairing – organizations who will​ support entrepreneurs throughout the program by facilitating key advisor introductions, pilots, research, and even investment opportunities. After rigorous matchmaking, ​ThinkGenetic was paired with two dedicated champions: Shire Plc (Shire) and Massachusetts eHealth Institute (MeHI). Shire, the global leader in serving patients with rare diseases, will work with ThinkGenetic to determine the capacity of its new artificial intelligence (AI)-driven diagnostic aid, SymptomMatcher™, to support finding patients with select rare genetic diseases. Shire feels a strong sense of urgency to address the unmet medical needs of those struggling with a rare disease and actively seeks innovative solutions, like those ThinkGenetic is developing, to help improve the lives of patients and those who care for them. In addition, MeHI will guarantee ThinkGenetic access to appropriate state groups, and to act as a convener to help engage appropriate industry stakeholders within the Commonwealth of Massachusetts in support of the company. The program lasts six months, and with it will come exciting announcements. We encourage you to keep an eye on the developments of the PULSE@MassChallenge program by signing up for email updates. To subscribe please click here.